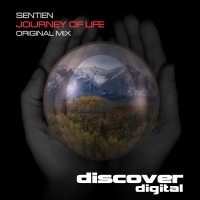 Next up Discover digital bring you Sentien - Journey of Life. And its a real journey of a track too. A warm bubbling bassline introduces the tune and the topline melody is catchy and infectious with cool key changes that herald the drop which explodes into the field of acoustics known simply as "epic". This is peak time lushness at its very best. 'Journey of Life' is available now from Beatport and iTunes.